Trash Orchestra is looking for a beginning to intermediate drummer willing to learn and grow with us. Plus points for tenacity, self-motivation, passion, courage, righteous anger about the state of the world, and experience with non-hierarchical projects. 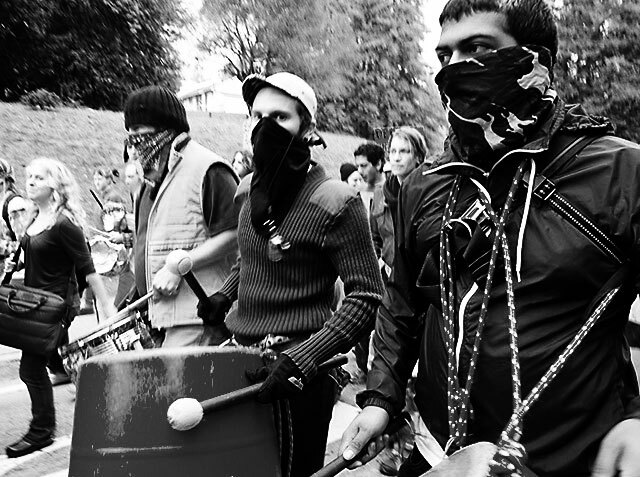 We are an improvisational marching percussion band – a bone-shaking recycled orchestra. We make percussion on tuned cans, hubcaps and barrels, drums, pieces of sheet metal, and homemade oddities. We are amateurs in the best sense -- from the root of the word, amo -- people who make music for the love of it and as a form of resistance. Influences: Stomp, Tom Waits, Infernal Noise Brigade, ¡TchKunG!, Rhythms of Resistance, samba, Loyd Family Players, Brass Liberation Orchestra, James Brown, drumlines, Gotan Project, Rage Against the Machine, Gamelan Pacifica, Street Drum Corps, taiko, the military drum bands of our youth, and a dozen other radical marching bands engaged in active resistance. Vision: We want to see Trash Orchestra grow to dozens of regular players. We'd like to see invites from far and wide pouring in to make noise and celebration in places across the globe. We see everyone in the band becoming virtuosos of their own handmade musical creations. We are ambitious in our plans to conquer the world and make it a better place full of music and dancing and resistance. We have weekly 2 to 3 hour practices and great gigs coming in. Since this is a labor of love, the orchestra is unpaid, and gig money goes into a communal pot for travel and education. If you are a drummer with a variety of rhythmic influences and interests and are full of rebellious insolence, we'd like you to play with us. Please send us your interest, your influences, the instruments you play, and your experience level.